Deliciously Vintage is a small family run business, owned by Husband and Wife team, Richard and Christine. Richard’s dream has always been to own a VW Split Screen Camper Van. After their Wedding in 2011 he became more determined to make this dream come true. At Deliciously Vintage, we know that every wedding is as unique as every couple, we love listening to your ideas to create the perfect experience, which is as special as you are. 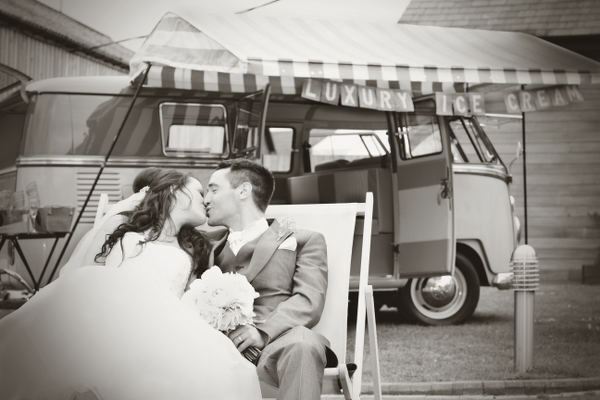 We thrive on serving Luxury Ice Cream from our custom designed 1967 VW Camper Van, Buddy The Ice Cream Van. 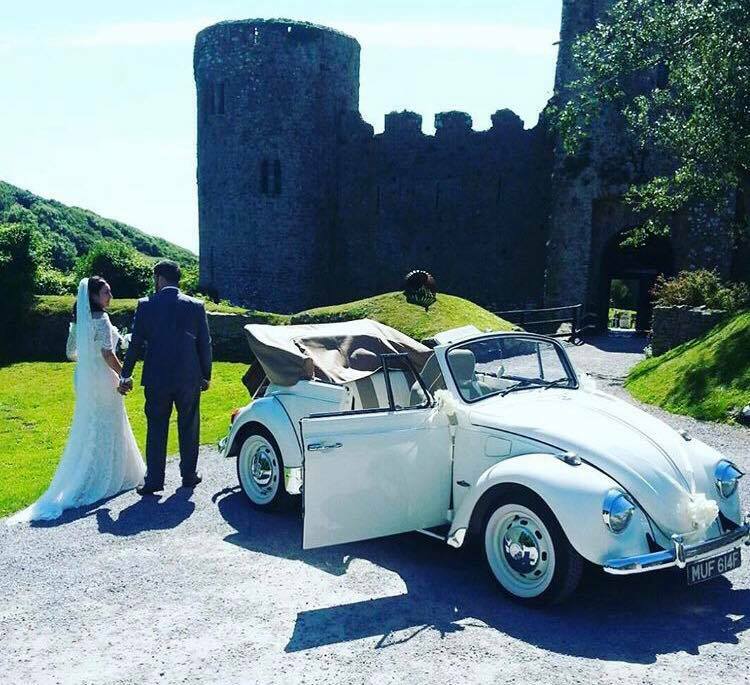 We also can provide Wedding transport with Bella, our 1968 VW Beetle Cabroilet. We are based in Carmarthen and offer VW Ice Cream van hire and VW Beetle Cabroilet Hire in Carmarthenshire, Pembrokeshire, Swansea, Cardiff and if you do need us further afield, please get in touch to discuss. “Buddy”, our pride and joy, is a VW 1967 Split Screen Camper, who has been fully restored and converted into a Luxury Ice Cream Van. Buddy loves to attend Weddings, or any other events to show off his stunning body and get plenty of attention and to provide the service that he does best….serving delicious Ice Cream. He loves to pose and is only too happy for people to sit in his stylish interior and pose along with him for photos, especially if you are enjoying one of his Ice Creams. Buddy will also come with 2 vintage traditional wooden deck chairs, along with an extra special “Mr & Mrs” double deck chair (can also be personalised to suit you). These are set up, along with an original cantilevered canopy, all of which are in keeping with Buddy’s unique style. “Bella” the Beetle came to join us in September 2014. We were looking for that special little something to add to our “family”, when we spotted Bella. She had been used as a Wedding Car previously, but she hadn’t had many bookings, so her owners decided to sell her. Straight away we could see why, she just needed a little TLC and a makeover, and we were certain this would then make her a popular choice for Wedding transport. She spent 6 months being lovingly restored to make her perfect, which she most definitely is! She is a beautiful, subtle shade of ivory, with a tan / beige soft top roof, with a matching interior. She looks brand new, yet maintaining her original, vintage looks. Bella is now available for Wedding transport. Bella comes with a vintage “just married” suitcase, which is attached to a shiny chrome luggage rack on her rear end, for after you say “I Do”. She also carries a bottle of something sparkly for you to celebrate with. Buddy is a VW 1967 Split Screen Camper, who has been fully restored and converted into a Luxury Ice Cream Van. Available for hire for any of your special events with a dazzling choice of delicious Ice Cream. Contact us about hiring Buddy today! Bella is a 1968 VW Beetle Cabroilet. She has been lovingly restored to transport you to your Wedding in true vintage style. Her classic colour scheme of vintage ivory, with a tan / beige roof, with matching interior will blend in with any colour scheme. Bella can be hired with Buddy or individually. 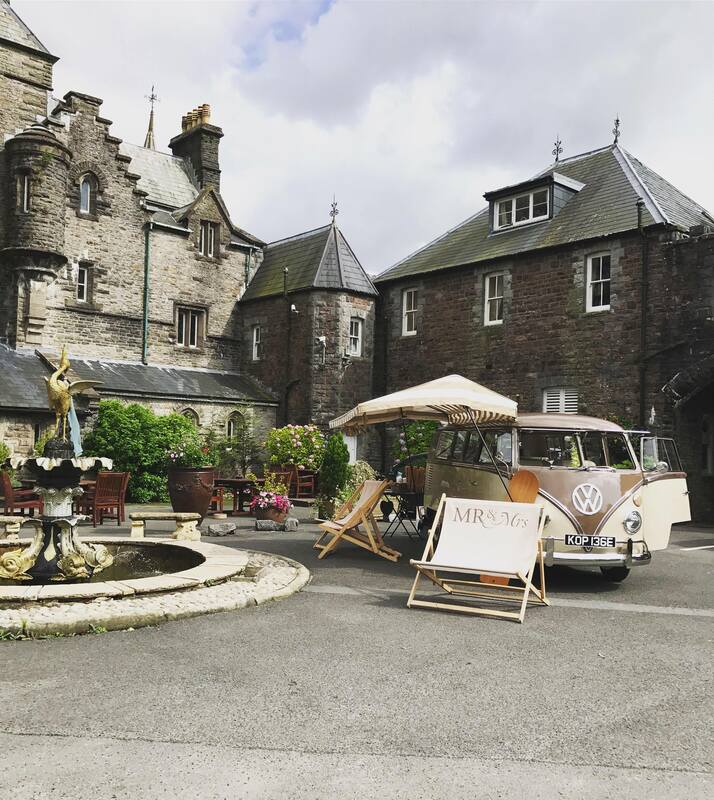 © 2019 VW Camper Van Hire for weddings & events | Deliciously Vintage, all rights reserved.